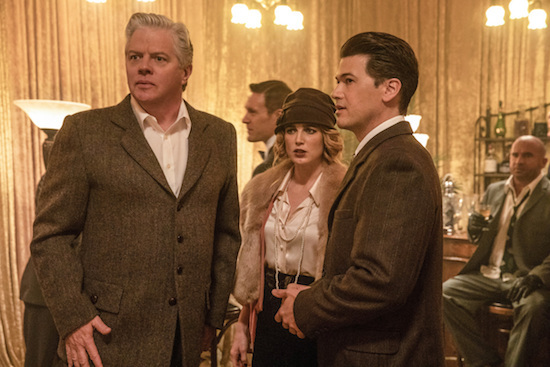 DC’s Legends of Tomorrow — “Tender is the Nate” — Image Number: LGN406b_0036jpg — Pictured (L-R): Tom Wilson as Hank Heywood, Caity Lotz as Sara Lance/White Canary and Nick Zano as Nate Heywood/Steel — Photo: Jack Rowand/The CW — ÃÂ© 2018 The CW Network, LLC. All Rights Reserved. ARROW: The last 20 minutes of the episode were pretty incredible. The elaborate (multi-level) fight sequence was really impressive, and Oliver and Diaz’s one-on-one fight was great. But, uh, maybe Oliver shouldn’t have left Diaz until he was totally certain he was dead? I’m curious to see how the show handles Oliver post-prison. It seems like they should be pretty handcuffed—and certainly Oliver should be changed—but I guess we’ll see next week! THE VOICE: Well, Kennedy is still the person to beat. I’m again confused by the timing of the themed week. We’re just getting to know these contestants, and the past few weeks have been a blur as they rushed a gaggle of contestants into a small window of time. Why burn the fan choices now? Why do the viewing parties now? Why not do them in a week or two when it’ll have more of an impact? LEGENDS OF TOMORROW: Oh, it was fun having Hank with the Legends. It’s crazy that a minotaur felt like the least crazy thing the team has come up against in a bit. I really hope this isn’t the end of Nate’s time with the Legends. He was correct that you never really know when things are going to come to an end, but he was a fun addition, and it would feel like a loss to not have him around while Charlie is adjusting to the team. MANIFEST: Lots went down, and it’s a shame the show didn’t give the characters a bit more time to process Vance’s death. He seemed like he would have been a good ally going forward. Grace kicking Ben out was…harsh. It makes sense she’s scared. It would make sense she would do anything in her power to protect Cal. And it wouldn’t be healthy for her to pretend the last five years didn’t happen. She had to go through an extraordinary trauma, both with thinking she lost her son and husband. But yikes. Separating him from Cal and Olive feels truly cruel, especially given it’s clear things are going on beyond anyone’s control.